No two teens are alike, but many of them experience the turbulence of puberty when anger and stubborn attitudes are just a part of daily life. Help your teen navigate this stage by working with them to find a hobby that they love. One or two passionate hobbies can keep your teen busy and give them an outlet for emotions they aren’t quite comfortable with yet. Helping your teens find hobbies may seem intimidating, but we have some ideas that might ease your way. It’s true that teens are mercurial, constantly changing their likes and interests based on what’s popular. As their parent, you have an advantage because you’ve known them the longest. You have watched their likes, dislikes, and skills grow over time. Ask questions often and pay attention to know what they watch, play, read, and follow. You may find a link between their daily habits and a new hobby they’ll love. We all know that teens hate feeling like they’re being made to do something. 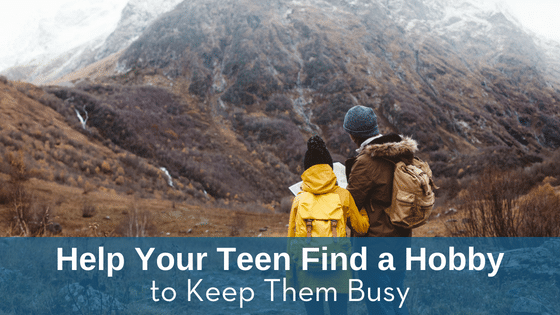 As the parent of a teen, it’s essential for you to be open-minded as your teen begins to tackle a new hobby. We recommend encouraging your teen to think of some hobbies, rather than presenting them with a list of ideas. If one of their ideas is a winner, try participating together. Teenagers can quickly lose interest. They may want to learn the guitar, but once they come up against a roadblock, they might want to stop lessons. It’s not your job to keep them interested in something that bores them. It’s important to teach them the value of perseverance, but the point of a hobby is for it to be enjoyable, not a chore. If your child loves to sing, listen. If they love to practice taekwondo, go to the demonstrations. Encourage them and take time to admire their projects. Teens have a keen sense for when you’re being genuine and honest. Make the time to listen to their stories and discuss their new hobbies. Encouraging your teen to find new hobbies is a great way to encourage them to stay healthy, broaden their interests, and stay busy. Teens that are mentally stimulated are less likely to experiment with drugs or alcohol. Having an honest conversation with your teen about their interests could also lead to a conversation about the dangers of getting involved with drugs and alcohol. Previous ArticleAre You Concerned That Your Teenager is Abusing Opioids?